1099-K Software for 1099-K Print, 1099-K Mail, & 1099-K eFile Services. Business rules quickly identify data errors during import and manual entry. 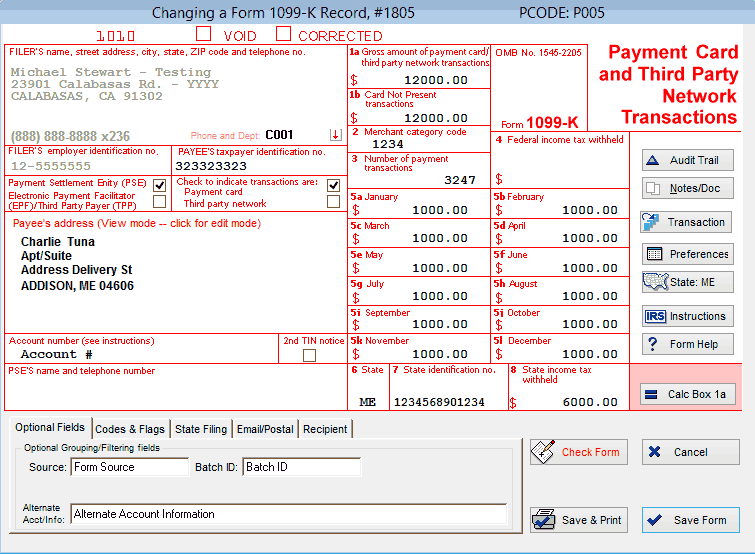 A Calculation button automatically totals Box 1 (Gross Payments). Filers can enter required IRS Merchant Category Codes (MCC) or equivalent industry codes into Box 2.
Business rules ensure accurate city, state and zip information. 1099 Pro tracks the transaction count total to ensure that Third Party Payers (TPP) only report payees with over 200 transactions. Complete forms under any filer type such as Payment Settlement Entity (PSE), Electronic Payment Facilitator (EPF), or Third Party Payer (TPP). 1099 Pro, Inc. offers free technical support to all current and potential customers via phone support, and online chat for our software. No matter how complicated your question is, we'll always find a solution. This January, our support team has extended their availability to include Saturdays from 8am to noon (PST) so you can get the help you need, when you need it. You're all in one stop for 1099-K software & 1099-K efile software for 1099-K printing & filing.